Emerging models of healthcare payment and delivery, including accountable care organizations (ACOs), present an opportunity to improve quality outcomes and lower costs for individuals with complex health and social needs. Understanding how ACOs manage care for this population can help build the evidence base for which strategies should be spread more broadly and where more research is still needed. Since 2012, the National Survey of ACOs (NSACO) has examined factors that influence the formation, implementation, and performance of ACOs and provides comprehensive data on ACO characteristics, capabilities, and strategies. 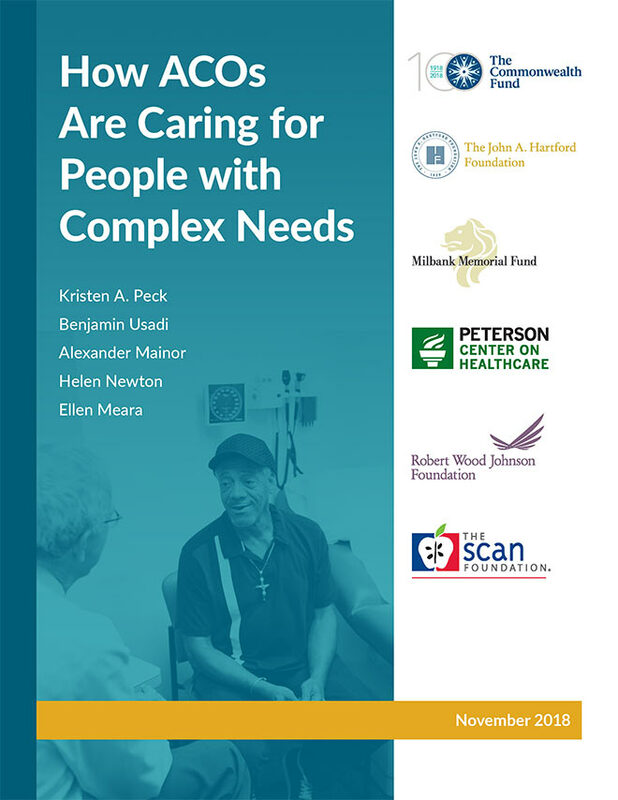 With support from the Six Foundations Collaborative, researchers at the Dartmouth Institute for Health Policy & Clinical Practice used a cross-sectional descriptive analysis of its most recent NSACO, fielded in 2017–18, to better understand which evidence-based approaches ACOs use to manage care for people with complex needs. However, the analysis also found that the number of evidence-based strategies implemented varies widely across ACOs. Even among ACOs that report having comprehensive care management programs, relatively few have multiple evidence-based strategies in place. Additionally, strategies thought to be especially effective for high-need patients (e.g., integration of behavioral health services) are not widespread. The majority of NSACO responders report that they offer comprehensive chronic care management programs for people with complex needs. However, there are several evidence-based strategies in which ACOs are not investing, which suggests opportunities for improvement. It will be important for the field to build the evidence base for which interventions have the greatest impact on quality outcomes and costs of care for high-need patients, and identify ways to accelerate their adoption on a broader scale.